An active player committed for almost 150 years in France, Apprentis d'Auteuil builds, with its international partners, support, educational, training and insertion programs with 50,000 vulnerable young people and families worldwide every year.TRUST CAN SAVE THE FUTURE. Due to our considerable experience with young people and families in difficulty, Apprentis d’Auteuil and our partners state that parents in vulnerable social and economic situations can frequently encounter educational difficulties with their children. Such families need appropriate support. And the return of a child into the family after the child was placed in an institution or lived on the streets. In all cases, the focus is on guaranteeing the security and well-being of the child while enhancing the parenting experience. It functions at specifically allocated locations such as the Family Open House, for example, or supporting the individual within the family and community. Internationally, Apprentis d’Auteuil helps many partners who work with children and families. 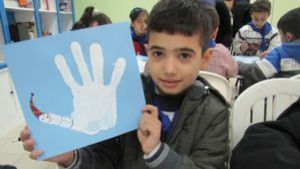 Whether in Morocco, Lebanon, Mali or Canada, families are given the support they need to help their children thrive, despite sometimes difficult environments. Our partners offer places where families can come to recharge their batteries in a place where they can talk and relax, develop relationships with others, equip themselves to better meet the needs of their children. Parents who are isolated and often ostracised by difficult socio-economic contexts are desperate to be able to meet other parents to collectively build a future for their children and for the society they live in. Apprentis d’Auteuil helps them with their activities. Furthermore Apprentis d’Auteuil has a reciprocal relationship with the people it helps and takes inspiration from the experiences of others to enrich its own support methods and schemes. The challenge is to encourage the creation of an extensive network of international actors working with families, boost our actions, build up current practices and develop new knowledge. To this end, in June 2014 Apprentis d’Auteuil started up a community of practices and knowledge with ten partners from Europe, Africa, the Middle East and Canada. The aim of this community is to develop new tools, new approaches and to encourage experimentation and large-scale innovation. The Family Open House is one of our programs that offers support to families. While trying to break family isolation and reduce their fragilities, these structures are designed to improve their family experiences by sharing with other parents and experiment with new ways of doing things with their children. It is not about deciding for them or to force solutions upon them but rather strengthen their power to act helping them to rediscover confidence by exchanging views and mutual assistance. Families that are welcomed at the Open House are involved in the implementation of the missions and activities proposed. They are therefore active participants and not clients. 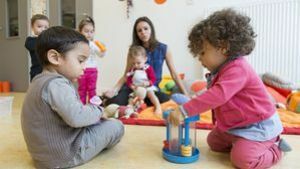 Situated in an underprivileged area in Bordeaux (south-west), the childcare centre, Les petites pousses du Lac welcomes children between the ages of two months to four years old. This Apprentis d’Auteuil establishment also provides parental support, in particular, helping isolated mothers in their educational role: we organize coffee hours, meetings with psychologists and instructors… We also work on professional insertion thanks to extended opening hours at reception, emergency placement as well as training activities in partnership with an association for further and general education. Roueisset, a city found in north-west Beirut, is located in a region with a population of quite different religious and ethnic origins living together. All residents suffer from great poverty and its consequences: unemployment, alcoholism, prostitution, violence, insufficient education, discrimination and abuse. Women and children are at greater risk. In 1998, the Good Shepherd Sisters created a social centre for children and their mothers. This centre offers children tutoring, training in computer technology and foreign languages as well as educational and teaching activities. The mothers are trained and are accompanied in their educational role. For four years, Apprentis d’Auteuil has been supporting the Sisters and their teams in terms of pedagogical training and financing foreign language and computer training co-funded by Air Liquide Foundation. Today the centre welcomes 300 children, 250 families are helped, 50 young girls, married women victims of domestic violence, single women. Young girls that have been sexually assaulted are lodged in the housing facilities. The El Khir organisation was founded in Essaouira, in1998 with the aim of improving the living environment of women and children through various projects such as literacy, non-formal education and also by promotion the rights of women and employability training. In March 2014, El Khir opened a social day nursery in the district of El Malah d'Essaouira. The nursery takes in around 45 children from disadvantaged families. The nursery promotes equality, social diversity and discovery of others. It offers services that are hard to find Essaouira: educational activities with professional team leaders, awareness workshops to strengthen parenting relationships, childcare at lunchtime, end-of-term outings for parents and children, one balanced meal per day and medical care. Strengthening the ability of mothers makes them more available for their children and their education. A social worker ensures regular monitoring of children within their families. Apprentis d’Auteuil is a deeply committed catholic foundation, recognized as promoting the public interest in France and in more than 50 countries. Thanks to the expertise and experience of the foundation and their partners, Apprentis d’Auteuil have been able to supervise more than 23.000 children in France and almost 20.000 children and families worldwide. Its main goal is to help youth in difficulty by conducting educational projects and to boost their ability to participate in society as full-fledged citizens by promoting training and insertion programs worldwide. In addition to their actions towards helping vulnerable children, Apprentis d’Auteuil and their partners assist struggling parents in their family obligations, with coeducation as the guiding principle. The key purpose is to improve the management of children under their care and to enable them to grow as free and responsible adults. To make a donation for education – Please contact the foundation for underprivileged children Apprentis d’Auteuil.